Division III Southwest District Coach of the Year Jeff Jenkins credited his senior-dominated Bellbrook High School football team with his success this season. Bellbrook finished the year with a 10-1 record and was ranked No. 2 in the final regular season D-III state poll. Bellbrook High School football head coach Jeff Jenkins gestures from the sidelines during a recent game. Jenkins was named the Division III Southwest District Coach of the Year this season after his Golden Eagles went 10-1. 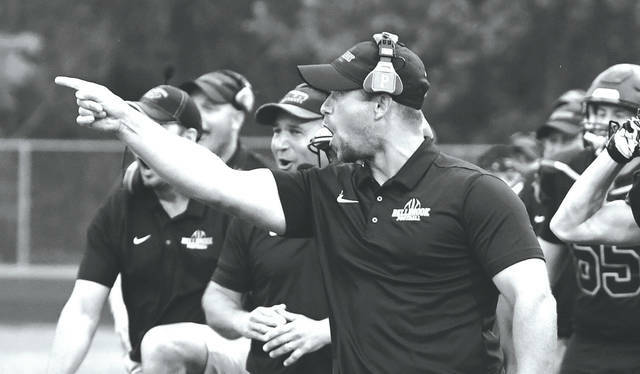 BELLBROOK — Before the first touchdown was scored, Bellbrook head football coach Jeff Jenkins had an idea that the 2018 high school football season would be special. He just didn’t know how special. “We felt pretty confident in our guys this summer,” Jenkins said Nov. 21 in a phone interview. “We knew we were going to be a senior-loaded team — we had 20 seniors on the team this year — and quite a few of them had a decent amount of experience. Jenkins’ premonition was right on the money. Bellbrook finished the regular season as the Southwestern Buckeye League’s Southwestern Division champions. The Golden Eagles were 6-0 in the SWBL Southwestern, and 10-0 overall. Bellbrook was rated No. 2 in the final Associated Press Division III regular season state poll. The team’s only loss came in the first round of the D-III Region 11 postseason playoffs, losing to No. 7-ranked Thornville Sheridan, 27-19. On Nov. 14, Jenkins was named as the Division III Southwest District Coach of the Year. Two of Bellbrook’s seniors — running back Justin Sloan and offensive lineman Ethan Knisley — were named to the D-III’s first-team offensive squad. Senior back Sedric Ferguson was a second-team all-district selection. 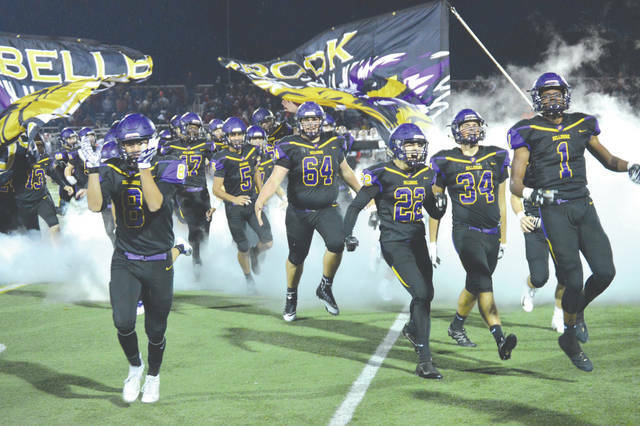 Jenkins, in his third year as Bellbrook’s head coach, said a Sept. 21 come-from-behind 21-17 win over eventual division runner up Franklin in Week 5 was the moment he truly knew that this Golden Eagles team had what it takes to win them all. “We were down going into halftime, one of the only times that we’d been down at the half. Our guys had to battle back, and that seemed to be what we had been lacking the last couple years. That ability to come back in a game against a good team. We needed that desire and ability to come back and win late, and that’s exactly what we did,” he said. Bellbrook Athletic Director Charlie O’Dell said the entire community has rallied in support of coach Jenkins and his team. “Our athletic department, our school and our community are very proud of the young men in our football program. The program is first class and that all starts with the head coach. Coach Jenkins has great attention to detail and it shows in the way his players play. The young men of Bellbrook Football play with tremendous passion and that same attention to detail that their coach has. Coach Jenkins has great respect in our community and in particular amongst his players,” O’Dell said. Jenkins was gracious in accepting the Coach of the Year accolades.